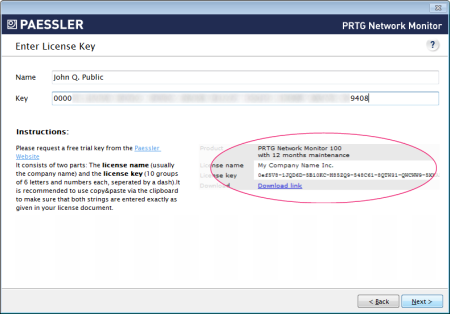 Can you please offer help for the PRTG setup wizard Enter License Key screen? How can I enter valid license information? Where do I get my license key from? What do I have to enter in this screen? Please enter valid license information. Please enter both the Name and the Key as shown in the email you received from Paessler. Enter license information to continue or go back and choose to install the Freeware edition. No license key is required for the Freeware edition. It depends on the selected edition where to get your license key. To get a free trial license key, please register. Please visit the Paessler trial website at http://www.paessler.com/prtg/trial and fill out the form. You will receive a free license key via email within minutes. Once received, enter name and key exactly the way it is written in the email. We strongly recommend using copy and paste for this! The Starter Edition is an extended freeware edition for people with a PRTG banner on their website. It supports up to 20 sensors. To get a starter edition license key, go to the Free PRTG Banners page, choose a banner, and put it on your website. Then, send a quick email including the URL of your web page to sales@paessler.com. You should receive your starter edition key usually within 24 hours via email. 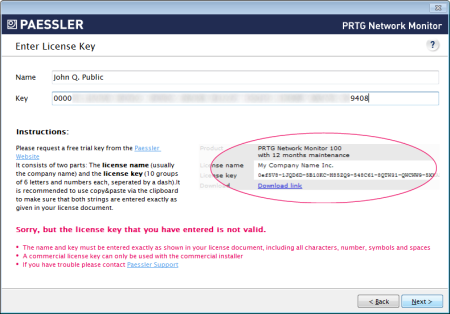 If you have not purchased a PRTG license yet, please choose and buy a license now. You should receive your license key via email after your purchase. In order to re-send your license information, please log in to your Paessler customer account.